In 2010 William Speir introduced the world to a super secret organization known as the Knights of the Saltier, a group of patriotic men and women dedicated to helping the legal authorities of the world maintain law and order. Into this highly complex organization he set his protagonist, Tom Anderson, a former military officer looking to find meaning in his life beyond the normal goals of career and monetary success. By the end of that first volume, Anderson had joined the Knights and discovered his own father was one of the Grand Masters. At the time I reviewed Knights of the Saltier, I made a point of applauding its originality in giving pulp fans something new and fresh. With this second entry in the saga, author Speir has inadvertently gone down a very popular plot path considered to be one of the most remembered in the history of the genre: In 1934 Popular Publications launched Operator 5, the adventures of a Secret Service agent named Jimmy Christopher. The stories were penned by veteran pulp scribes Frederick C. Davis and Paul Tepperman. Tepperman was responsible for the 13 interconnected novels that make up The Purple Invasion, a series in which the Purple Empire (an unnamed European power) conquers the United States after conquering the rest of the world. The protagonist, Christopher, then leads the insurgency against them. The saga is often referred to as the War and Peace of pulps. In Crusaders of the Saltier, Mr. Speir has America conquered but not by an outside force. Rather it is seized from within by a corrupt Washington Administration led by a megalomaniac president set on a course of tyranny and using his power to illegally circumvent the Constitution. When dissenting Americans begin mysteriously disappearing without due process, the Knights of Saltier must confront their greatest challenge ever: How to battle corrupt government agencies and restore the country to the rightful rule of the people. This is an intense thriller with a fascinating, and very chilling plot line that is extremely well realized. Mr. Speir balances the action sequences with the more mundane occurrences in Anderson’s life, such as his meeting a lovely young woman and falling in love—all while caught up in the Knights’ struggles to save the government. William Speir’s skills as a storyteller are growing exponentially with each new book. Once again I heartily recommend this to pulp fans looking for a new twist on action-adventure prose. 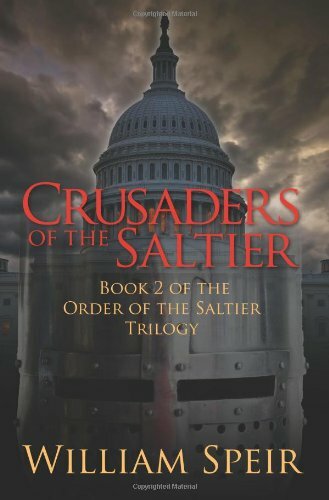 Crusaders of the Saltier is a terrific book in a truly excellent series. Looking forward to the final book of the trilogy. Ron Fortier is an author and a frequent reviewer of pulp fiction. He is currently working on a new comic series, Mr. Jigsaw, Man of a Thousand Parts, from Rob Davis’ Redbud Studio.